One of the most popular tourist attractions in the exciting city of Bangkok in Thailand, is Wat Arun. Known locally as Wat Chaeng, it can be found on the west side (Thonburi) of the mighty Chao Phraya river. It’s definitely a stunning temple with a spectacular design which is very different to the vast majority of other temples you can see in Thailand. Wat Arun or Temple of the Dawn is made up of colourful decorated spires that provide mesmerising images over the water on the easy to find riverside location. If you’ve never travelled to Bangkok before, this temple is virtually opposite one of Bangkok’s other famous temples, Wat Pho, so it’s quite easy to find. Considered to be one of the most beautiful temples in Thailand, you’ll be bowled over by the awesome architecture and the quality of craftsmanship. The spire or prang located near the bank of the Chao Phraya river is a world-famous landmark. This imposing spire rises into the sky at a height of around 230 feet. It’s wonderfully decorated with minute pieces of coloured glass and Chinese porcelain which were placed delicately into amazing intricate patterns. If you’re up for it, you can climb the central prang. The steps are extremely steep so getting up and down can be a little tricky. The views from the top are well worth the effort. 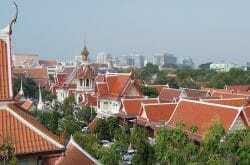 You can see the winding Chao Phraya river, the Grand Palace and Wat Pho. The Ordination Hall has a fantastic golden Buddha image and murals that decorate the walls. No visit to Bangkok would be complete without seeing Wat Arun. To get there, travel on the river boat from Sapphan Taksin boat pier which will take you to Pier 8. From there hop onto a small shuttle boat for a short journey from one side of the river to the other. This will cost about 3 baht. The quietest time to visit is early morning before the crowds arrive and although known as the Temple of Dawn, Wat Arun is absolutely breathtaking at sunset, especially when lit up at night. Wat Arun is open every day from 8.30 a.m. until 5.30 p.m. There’s a small entry fee of 100 baht. Remember to dress appropriately, no shorts, no short skirts and nothing too revealing. To appreciate the beauty and splendor of Wat Arun, spend at least a couple of hours here. 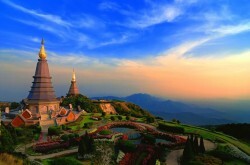 Lovely temple, absolutely stunning at sunset!